It’s cucumber season in our part of the world. We can’t seem to harvest them fast enough in our backyard garden. And every farmers’ market is overflowing with them. So how about turning some of those cukes into a cool, refreshing first course? One that’s brimming with flavor, but not too heavy. Chilled Cucumber Soup is the perfect summer starter. It’s also a versatile performer—you can change up ingredients to give it a different character every time you make it (more about this in the Notes). Best of all, it takes just minutes to prepare in the food processor. You can make it ahead of time too. In fact, the flavor improves if you allow it to rest in the refrigerator for a few hours, or even overnight. So whip up this soup—and then head to the hammock for a summertime siesta. Because, hey, soup isn’t the only thing that improves with rest. Tangy yogurt seems to bring out the best in cucumbers. Which is why you’ll find this pairing in countless dishes served around the eastern Mediterranean. 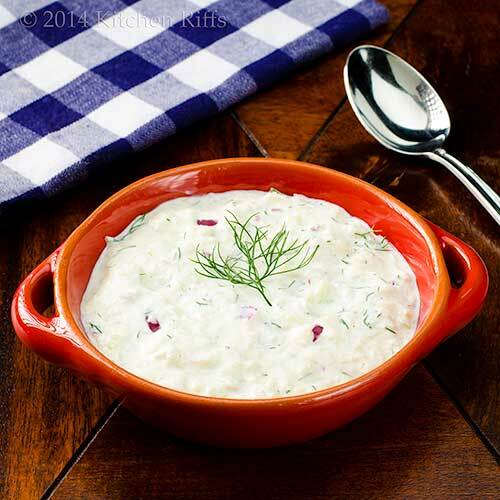 One of the more famous is Greek Tzatziki, and today’s soup is essentially a variant on that sauce. Greek yogurt is ideal in this dish, although you can also substitute regular yogurt. We prefer full-fat yogurt, but you can use low-fat or fat-free if that’s your style. This recipe is adapted from Judith Barrett’s Saved by Soup. The dish takes about 15 minutes to prepare, and serves 4 to 6 as a first course. Leftovers will keep for several days if stored in an airtight container in the refrigerator. Peel the cucumbers, then cut them in half lengthwise. If you’re using the common slicing variety, scoop the seeds out of the cucumber halves with a teaspoon (discard the seeds). If using a food processor, chop the cucumbers roughly, then whirl them in the processor bowl until minced (don’t purée the cukes; the soup is better with some texture). If not using a food processor, chop the cucumbers finely. Add the minced cukes to a medium mixing bowl. Peel a medium red onion, then cut it in half through the poles. Chop the onion roughly and add it to the food processor bowl. Peel the garlic and add it to the bowl. Process the onion and garlic until they’re minced (again, don’t purée). If not using a food processor, mince the onion and garlic finely. Add the onion and garlic to the cucumbers in the mixing bowl. Wash the dill and strip the leaves from the stems. Then chop the dill finely (or whirl briefly in the food processor). Add the dill to the cucumber mixture. Stir the cucumber mixture briefly to combine, then add yogurt. About 2 cups of yogurt makes a fairly thick soup (which we prefer). If you want a thinner soup, add some water or milk (perhaps a cup). Add the lemon juice and olive oil to the cucumber mixture, then stir vigorously to combine all ingredients. Taste and add more lemon juice (or olive oil) if necessary. Add salt and pepper to taste. At this point, you can chill the soup briefly and then serve it. But the soup tastes better if you refrigerate it in an airtight container for an hour or longer (even overnight) to let the flavors mingle. 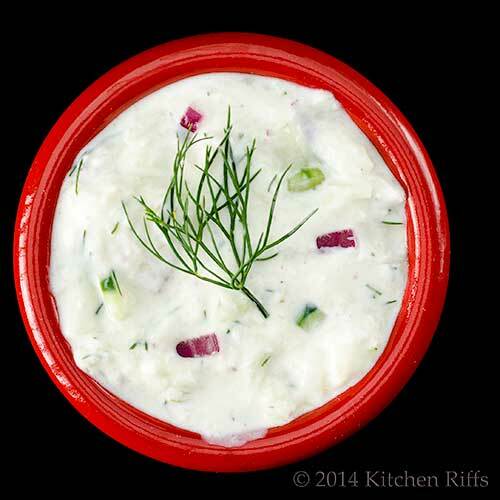 When ready to serve, ladle the soup into serving bowls and garnish with sprigs of dill or mint. This recipe works better if you peel the cucumbers, though you can leave some of the peels on if you like (they add nice color). Remember that most supermarket cukes are waxed, so you probably don’t want to eat the peels on those. We tend to think of cucumbers as vegetables, but they’re actually fruits (just like tomatoes). Cukes probably originated at least 3000 years ago in the Middle East or western Asia (most likely India). They eventually spread to Europe (perhaps via the Greeks or Romans) and later to North America. Cucumbers are sensitive to heat. So once you pick them from your garden (or bring them home from the market), you should refrigerate them immediately. Red onion adds nice flavor and color to this dish. But scallions or ordinary yellow or white onions work well too. You could probably substitute kefir for yogurt in this recipe (though we haven’t tried that). Fresh dill works better than dried dill in this dish, but you could use the dried version in a pinch. No dill on hand? Fresh mint makes a wonderful substitute. Or drop the dill entirely and substitute parsley or cilantro. If you’re using cilantro, you might want to add 1 or 2 jalapeño peppers (dice them finely by hand or in the food processor). You could also add some chopped tomatoes to the dish (riffing off an Indian raita). A bit of dried cumin or coriander powder would go nicely in this soup, too. And maybe some cayenne pepper. You can substitute red wine vinegar for lemon juice if you wish. You can also add some raisins or chopped nuts to this soup (which will give it a more Middle Eastern character). Or stir in a bit of almond milk for yet another dimension. Basically, if you think a particular ingredient sounds good in this soup, it probably will be. I'm not much of a fan of cucumbers per se but I do LOVE Tzatziki! I actually made a cucumber watermelon salad last night for Marion and she loved it especially since I added blueberries. I whipped up a yogurt sauce with the fresh yogurt I just made and added a bit of pineapple juice. It really came out good and surprise of surprises, I didn't even mind the cucumbers! This soup is similar to Indian Raita. We use Cilantro and green chilies. Raita is so versatile that you can add bell peppers, carrots, mint leaves etc. They are so refreshing and a perfect cooler when served on hot summery days. Hi Louise, mystery plants are so much fun, aren't they? This is a good recipe if cucumber isn't your favorite flavor -- you do taste it, but there are so many other things going on as well that you have a mix of flavors. Thanks for the comment. Hi Marta, I'll bet versions of this dish are found pretty much around the world! Thanks for the comment. Hi Shibi, this really is a lot like raita. Except more soupy. ;-) Although now that I think about it, raita would make a pretty good soup as-is, wouldn't it? Thanks for the comment. As soon as I saw this I thought of Tzatziki; I love that cool combination and can imagine it's fantastic as a soup. Need some cool meal ideas right now; it's definitely the dog days here. Hi Barb, isn't this a nice combo? And we need all the cooling dishes we can get! You know what St. Louis summers are like. ;-) Thanks for the comment. Hi Judy, I like cukes and yogurt! Tons of flavor, and so refreshing. Thanks for the comment. Hi Rocquie, this soup fits in with almost any kind of meal -- really versatile. Thanks for the kind words, and comment. Hi Sherri, happy to make you smile! ;-) We just can't resist corny puns. Thanks for the comment. Hi Dottie, I've got another batch of this in the refrigerator right now! Probably have it for dinner tonight. ;-) Thanks for the comment. I would love to try your recipe just as is though, it would be light and refreshing! How cool and refreshing is this? Love the flavors. Thanks for this summertime inspiration! I love me some tzaziki! And this is a perfect idea for all those cucumbers.What a souper cold soup for slurping! My garden is nonexistent this year other than raspberries and herbs. Just finally need to get the yard in shape before I can focus on the other stuff. thanks, John! Hi Uru, this is very similar to raita. And all the other cuke & yogurt combos around the world! Awfully good, though. Thanks for the comment. Hi Karen, this really is refreshing, and so nice for the hot weather we're having. Thanks for the comment. Hi Alyssa, we have more cukes than we can handle! Although I'm sure we'll figure out something. ;-) Thanks for the comment. Hi Nee, glad you've been having fun with the kids! Much more important than blogging stuff. ;-) Thanks for the comment. Hi Abbe, tzaziki is really good stuff, isn't it? As is this soup. ;-) I'm jealous of your raspberries! Thanks for the comment. Hi Denise, isn't this perfect for cucumbers? And as you say, it's so refreshing. And tasty. ;-) Thanks for the comment. Hi Zoe, this really is such a cool and soothing soup! And it is indeed very refreshing. ;-) Thanks for the comment. Such a refreshing dish - I adore cucumbers and yogurt, in fact my mom makes a little palate cleanser with yogurt, cucumbers, tomatoes, onions and salt and pepper - your chilled soup reminds me of my mom's dish. This looks refreshing as can be for the summer. I bet it would be fabulous as a first-course to grilled lamb, too. John, you are right, this is a great soup for hot days and I really like the idea of using kefir. Now I just have to get me a hammock :) Thanks for the recipe! Hi John, this sounds very refreshing, love the dialog! Hi Shashi, your mom's palate cleanser sounds wonderful! Thanks for the comment. Hi Carolyn, I really like the idea of serving lamb after this! The flavors would go so well. Thanks for the comment. Hi Kristi, isn't this nice? And quite healthy too -- a bonus! Thanks for the comment. Hi Julie, glad you enjoyed the dialogue! Those are loads of fun to write. And very true to live. ;-) Thanks for the comment. Hi Pat, hammocks are a must, don't you think? ;-) Thanks for the comment. Hi Cheri, it really is refreshing. Glad you enjoyed the dialog, and thanks for the comment. Hi John, this sounds so cooling and delicious... I do love a good cucumber dish! Setting it aside for the summer. Chilly here! This is my favorite dip recipe. I make these with dried mint but I did not use onions before. May be I should try onions next time, I'm pretty sure it will give it a nice flavor. Thanks John. Refreshing, exquisite and wonderfully summery! A great soup. So the Indian variant on this is hardly a variant in recipe, but in use -- as an accompaniment to a fried rice or biriyani, as a raita/ yogurt salad. We might skip the garlic, but I say heck, why not leave it in. Sprinkling pomegranate over the top might provide a nice sweet-tart crunch, too. Bit like croutons, only so much better :) Loved the punny exchange with the Mrs! Love all the variations on this recipe - it sounds incredibly versatile. And I will never tire of the KR/Mrs KR banter. Reading it today nearly broth tears to my eyes. Hi Lizzy, this dish just isn't the same in the winter, so waiting for the warm weather makes a lot of sense. ;-) Thanks for the comment. Hi Amira, this is such a fun dish to play with -- so many things you can add! Thanks for the comment. Hi Rosa, it really is refreshing -- truly tasty. ;-) Thanks for the comment. Hi Deepa, love the idea of the pomegranate! Good taste, brilliant color. ;-) Thanks for the comment. Hi Beth, :-) Glad you enjoy the banter -- the puns today were just too easy. And this soup is really worth a try -- truly excellent. Thanks for the comment. I will for sure be making this, but sans yogurt! I just love cucumbers! They are so refreshing. I make a lot of salads with them, but never soup - sounds great! Hi GiGi, you can create your own dish with this! ;-) Thanks for the comment. Hi Laura, cucumbers are great, aren't they? So refreshing! Thanks for the comment. This is one of the dishes that I can remember the first time I had it, where I was and who I was with. For some reason I was captivated my it. It really is waaaaaaaay more tasty than one would suppose when thinking about making soup out of cucumbers. As you pointed out cold soups are perfect during the heat of summer. Wow, that looks so refreshing! I love cold soups and what a great way to use cucumbers. Hi Carol, this really is a memorable dish, isn't it? Awfully good. Thanks for the comment. Hi Kristy, cucumbers don't get enough love, IMO, but in this dish they're a star! Thanks for the comment. Perfect summer soup! I wonder if Bill would eat this since it's not obviously made of cucumbers? Well, not to worry, I'd happily eat his share! After reading the recipe I wish I had cucumbers growing in my garden. This sounds like a great soup for summer. Hi Liz, you'll be glad to have Bill's share, trust me! This is good stuff. ;-) Thanks for the comment. Hi Dawn, it really is a nice soup. You'll have to grow some cukes next year! Thanks for the comment. Wow, this soup is just perfect for the warm weather...cucumber and yogurt so refreshing and soothing...and I like the fact that it can be prepared ahead...thanks for the recipe John! Hi Juliana, this really is such a great soup for this time of the year. Totally refreshing, totally flavorful. ;-) Thanks for the comment. This looks so cool and refreshing. Keep the puns coming! Hi Mary Frances, this is really is refreshing. And good. ;-) Thanks for the comment. Hi Greg, isn't this soup such a great concept? Really good, and so easy. Thanks for the comment. John, your chilled Cucumber Soup looks sensational. Moreover, with the triple digit heatwave Mother Nature is throwing my way this weekend, the dish is an ideal way to keep it cool. Lovely work! Hi Brooks, it's been cool here the last few days but tomorrow will be a scorcher! Time to make some more of this. ;-) Thanks for the comment. You are lucky to have a backyard garden with abundant cucumber. What a cool and refreshing appetizer this will make? Yum! Yogurt dip - in any shape or form, you can't beat it. Of course it's a staple in our house, and I am always looking for great variations, and this garlic and dil version is perfect. Need to try it asap. Hi Holly, it is indeed so nice to have a garden! We love ours. And our cucumbers. ;-) Thanks for the comment. Hi Minnie, dip/soup -- it's almost the same thing. Almost. ;-) This is such nice stuff, isn't it? Thanks for the comment. Hi Charlie, I know about cukes being a fruit -- weird, isn't it? Sounds like you're enjoying your trip to Manhattan. We need to get back -- such a great place, isn't it? Thanks for the comment. Hi Lea Ann, there are only a handful of chilled soups that I really like, and this is close to the top of the list (my favorite is gazpacho). I love the flavor of this, and it's so refreshing in hot weather. Thanks for the comment. I've never heard cucumbers called cukes before - very cute. I make something similar using grated zucchini which I serve with shish kebabs. Hi Suzanne, cukes are indeed cute. ;-) Love the idea of zucchini -- will definitely try that. Thanks for the comment. This does sound really cooling and a great way to use cucumber. Hi Caroline, it's really a great recipe for cucumbers -- very refreshing, and quite flavorful. Thanks for the comment. Hi Dawn, gaspacho is my #1 for summer, too. But this is second. Falafel crisps? Great side with this! Thanks for the comment. Hi Chris, isn't this nice? I love cucumber soups! Thanks for the comment. How refreshing! I think I might like this as a palate cleanser between different spicy course. Really cools you down. Both you and Mrs. Riff are a hoot with your funny endings. Fun post! Just shared! I LOVE tzatziki so I would love this soup for sure. I'm going to give it a go even in the winter. Hi Bam, glad you enjoy the endings! We really enjoy writing them. And this would be a great palate cleanser between courses -- great idea. Thanks for the comment. Hi Maureen, your winter is cold enough, but tropical compared to your New England winters. So this should seem pretty refreshing to you. ;-) Thanks for the comment. Cold soups are a great change for once. I often forget about their existence but I do enjoy a good recipe that will tingle my taste buds. Thanks for sharing your version John, hope you guys have been fine. Beat the heat is right, this is a cooling and delicious way to start a meal. If you don't mind please post some of your garden pictures too. I always like to learn other vegetable garden setups. Hi Helene, this really is a fun recipe. And you might like adding chilies to make it even more interesting. ;-) Thanks for the comment. Hi Karen, isn't this nice? We're going to have it again this weekend! Thanks for the comment. Hi Shibi, our garden isn't anything all that special -- just 3 raised beds, each about 3 feet by 6. But if I can work it into a post, I'll post a picture. ;-) Thanks for the comment. What a great way to use cucumbers, this is something new and unique we have to try! Hi Pamela, we love cucumbers and always like to use them in different ways. This soup really is a winner -- definitely worth a try. ;-) Thanks for the comment. The only child soup I know is the Italian gaspacho, this is something different I need to try. Looks delish! but u guess i'll gonna be enjoying yout milder version, healthy choices soup my friend!!! Hi Raymund, gazpacho is my favorite cold soup, but this is my second favorite. And depending on mood, maybe my favorite. ;-) Thanks for the comment. Hi Dedy, this is rather similar to raita. And you're right that too much onion is too much! Thanks for the comment. Mmmm I love cucumber season and great idea to make them into this soup!! Hi Ashley, cucumber season is so nice, isn't it? Always nice to have such a plentiful supply! Thanks for the comment. You are right, Kefir works wonderfully in soups like these. And have the added probiotic benefit. Loved this post. Hi Ansh, we really need to try kefir in this! Thanks for the comment. I'll probably be picking my first cucumber this week sometime and the vines are loaded so we're fixing to have LOTS of cucumbers. What a great way to use them! Any no cook soup goes to the top of my list! Thanks for sharing John! Hi MJ, we have loads of cukes this year! Love it. And this soup. Thanks for the comment. With the hot weather we've been having in San Francisco, this is a perfect recipe! Hi Shikha, this really is a great heat-beating recipe. Refreshing, and awfully good! Thanks for the comment. ive never made soup with cucumber before, definitely try it when the warm weather returns! Hi Amy, it's really a refreshing soup. Worth keeping in mind for when your summer comes. Thanks for the comment. Hi Beauty Follower, this really is perfect for the summer! So good, I made another batch of it yesterday! Thanks for the comment. If only I had seen this before our picnic yesterday! Something must be wrong with my feed because I haven't seen any of your new post notifications--I'll have to fix that asap. Good to catch up with your blog again though--wishing you guys an awesome Sunday! Hi Ala, it could be Blogger's feed -- I've been hearing it's been funky lately. Thanks for the comment. 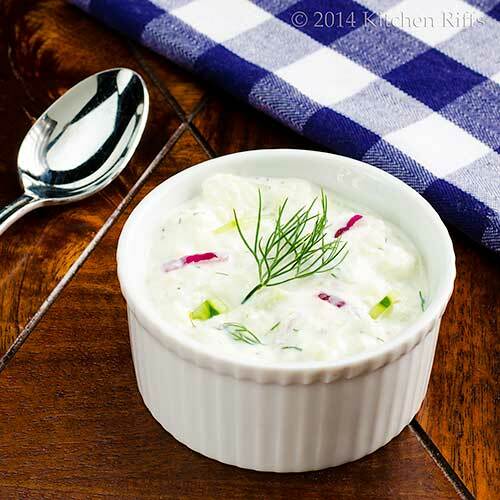 You are so right about yogurt and cucumbers marrying so well... and dill is beautiful with both. I can see adding tiny cooked shrimp to this and making it a meal! Hi Jamie, don't they make a lovely combo? One of the world's classics! Love the idea of adding the shrimp. Thanks for the comment. I'm kind of new here and i must say i kite what i see. Great soup! Hi Plantos, welcome! And thanks for the comment. Hi Nami, there really is no end of recipes! And this is such a great soup for this time of the year. Thanks for the comment. John, I'm really sorry I've been out of touch the last few weeks. My summer schedule has eaten away at my blog reading time. Anyway I'm back with lots of catching up to do. Cucumbers are my most favorite fruit this time of year. 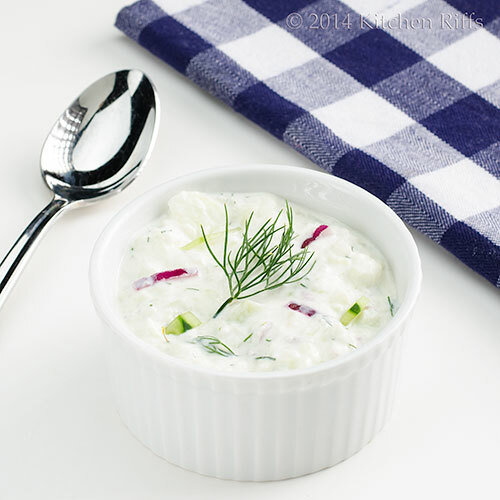 I love Tzatziki sauce and a soup version of the sauce are right up my alley! Great recipe and good way to use all those cucumbers I keep buying! Hi Bill, no worries -- I know how hectic life can get. And this is such a great soup for this time of the year! Thanks for the comment.